Can i have 2 ISP's at home? 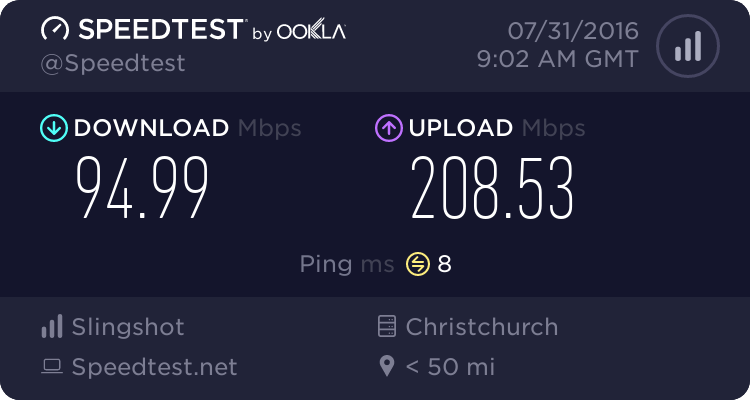 Forums › New Zealand Broadband › Can i have 2 ISP's at home? Is it possible to have 2 ISP's on one line here through a PPPoE connection on my PC? Im new to New Zealand, so internet works a bit different. He has an 80gb account with Telecom which includes a landline. Am i able to buy an unlimited account at say bigpipe and connect through my pc with that account while he can continue to use his own telecom? You will need a second line installed. How does the clothed option work then if there is an existing phone line in the home? Why don't you just pay the person you live with some money every month and upgrade their spark plan to unlimited data? macuser: Why don't you just pay the person you live with some money every month and upgrade your spark plan to unlimited data? His girlfriend said no. So im looking at other options. Seems strange that i cannot buy stand alone bandwidth when everything else is paid for. i could'nt agree more..haha. but it is how it is. Back home, i could use any ISP and multiple on 1 line. So each PC in the house could have their preferred Bandwidth. ReckITT: How does the clothed option work then if there is an existing phone line in the home? If there is an existing phone line in the home, this would need to be reassigned to the provider offering the clothed xDSL connection. In years past it was common to have the POTS line with one provider and ADSL with another - this is less common now. Depending on where you're located, you may be able to have a second connection on another network that can be run in parallel to the existing copper line, e.g. fibre or cable. Either way, if you 100% need your own dedicated connection, you will need something else installed. ReckITT: i could'nt agree more..haha. but it is how it is. where are you from originally and what service type was it, out of curiosity? Im from South Africa. and the way it works there is. You buy a phone line for a number and an ADSL line speed up to 40mb depending on area. And then you buy your ISP bandwidth from any supplier of your choice. So if 3 people in the home wanted to use 3 different bandwidth packages at three different ISP companies we could all use it on the same line. But the line speed installed would be shared with the PCs while using the same line. So eg. My parents had a capped account of 10gb. And i had my own unlimited which i paid seperatly and did'nt need to pay for a phone or ADSL line, cause my parents were paying for the one installed all ready. interesting, I didn't even know that was possible! Neither did I, and I am from South Africa too. Yeah i assumed this was possible anywhere in the world..lol. i mean over here you paying twice for the same thing then. Kinda seems unfair. I think i can do it? well it sounds like i can...haha. What's the difference between 'Naked' and 'Clothed' plans? These clothed plans are our broadband service running over your existing phone line. They're cheaper because your line provider is already paying the line rental fees to Chorus. Naked plans are for people who aren't paying a provider for an existing POTS line at their home, in which case we have to pay Chorus for the copper line rental to get your broadband connected (hence the extra cost). I'm not sure what happened in your home, but ADSL in RSA, seems to work the same as here... Reading a few providers information showed that you needed a Telekom line (called Chorus here) and then you pay the ISPS for your speed and data. This is exactly the same here. There is no way for 1 copper pair to connect to two different companies for Internet, (unless they're the same company with different brand offerings?). In plain English I think you were just paying the price upgrade to get unlimited for your parents line, and that's what you'd have to do here too... Unless you go for the second line install, or have cable/fibre/RBI installed as well. Good luck convincing the GF, that's your best bet TBH!